When did you learn Go and who taught you? I started playing Go when I was 8 years old. If my memory serves me right, I entered Go school to study soon after that. There were many teachers who taught me during those few years, but the one who helped me the most was Yang Jinhua 6p. He was a great teacher. Can you describe your study routine at the Go school? Was your stay there tough or fun for you? The routine was quite simple. I still needed to attend primary school during the daytime, and only 2 times a week in the evening. I would attend Go school to study, 2 hours each time. The 1st hour was the teacher's lecture, and the 2nd hour was a League game with an equivalent strength classmate. The teacher would then give a brief review after that. I did also go to a dojo to play with some strong amateur players during the weekends, but that's all. Studying at the Go school was quite fun, and I made many friends too. I wouldn't say it was tough actually, since during that period of time I very much enjoyed playing this game. Did you participate in tournaments back then? How were your results? "To be honest, my Go friends are the main reason I'm still in this game now." From your experience, what do you think is the main difference between pros and amateurs? This one is easy to tell: obviously pros take Go as their profession, they need good performance to earn their livelihood, so they study hard most of the time and into details; we amateurs have our own jobs and don't have much time for Go. At most we may play some games with friends in club evenings, some internet games online, mostly during the weekends. Therefore, our studies cannot be too deep; also, the training is definitely not comparable to that of pros. So in general we cannot compete with them. However, that doesn't mean we cannot win against pros. ^^ I did it a few times before (of course they were not that strong). With good preparation and analysis of your opponents, it's surely possible. Everyone has weaknesses, including the pros. Once your strength difference against him/her is inside a specific range, with good preparations it'll be possible. It seems that a new wave of young Chinese players is now challenging the Korean Go supremacy. What is your take on that? And please tell us who are now, in your opinion, the three strongest players in the world? Ah this question is hard, since I have to say I don't quite understand the young Chinese pros' games when I read them. On the contrary, I understand the Korean players more (though I myself am Chinese). ^^ At my level, I guess I can hardly say who are the strongest in the world. The ones I really admire and read their games quite often are Lee Changho, Kobayashi Koichi and Cho Chikun, notably Cho because of his very strong spirit and never give up attitude. You can feel his power of mind from his games. When and how did you discover KGS? I was working as a teacher in "GonGames" China trip in the summer of 2005 and my friends there introduced me to KGS. From then I came to KGS gradually more often, mainly because that's where I can easily reach my friends. To be honest, my Go friends are the main reason I'm still in this game now. Do you enjoy teaching online? Have you found any major difference between your European students and the Chinese players' attitudes toward the game? In regards to the 2nd part of this question, thank you for giving me this opportunity to talk to many Go players from Europe and America. I want to tell you that, compared to the Asian players, we may notice the phenomenon that we Europeans (also Americans) in general play relatively passively. At least that is the case for most players. How come? From my observation, that is mostly due to not having a correct guide from the beginning of our Go career. We often foster bad habits because of this. One notable bad habit is that we tend to care about our own stones, while not caring enough about the opponent's stones. I have described to many of my students that they are being "selfish on the Go board", because one should always treat their own stones and the opponent's stones equally. An example of this is when you have a weakness and protect it, but your opponent has the same or a similar weakness, but you do nothing to take advantage of it, or vice versa. Treat them equally, deep in your mind, and your Go will gradually become more "normal". : ) My advice. "...one should always treat their own stones and the opponent's stones equally." Let's talk a bit about the NGA (Nordic Go Academy). What has been your role in that project and how did it start? I'm just a co-runner in this project. Together with my friends Antti Tormanen (EGF 6d and currently an insei in Japan) and Juri Kuronen (EGF 5d), both from Finland, we all work as teachers. That is my role. Many of our friends have told us that they really want to have a strong player to guide them for their studies; however, they can hardly afford the fee. From that we thought it over and came up with the idea of the current NGA project system. With our current mode, we made it a lot cheaper and very much affordable to participants. They also get advice and comments regularly from us teachers, so as to gradually enhance their weak points in Go and get good improvement. So far, we received enormous positive feedback from the participants in the past few months, which prove our mode works quite well. We'll keep working hard on this. For now NGA is just an online project; some participants and our friends suggested that we might make NGA as a program in real life too. We're considering that and I guess it's possible. You have also worked as a teacher in previous editions of "Experience Go in China". Can you share with us some tips or experiences from that time? I'm no longer working for this program, and I won't be back to China this summer either. In the past summers I had some good memories, especially the time with my friends/participants of the program (some of them we didn't get to meet for years, hopefully you're all fine). To them I really want to say: thank you! I'll never forget you all; let's expect to meet again at some point in the future. What do you think about the future of Go in Europe (and the USA)? Do we have reasons to be optimistic? During the time I've been in Europe, in the past few years, I could see that gradually many young players from different countries joined this game and got good improvement; some of them are already quite strong and never stop their endeavor. So if you ask me if I'm optimistic, yeah I am, why not? ^^ Nowadays I'm working on fostering some young players in Finland, when I have spare time. Probably I can do more still, and I'd like to contribute my teaching ability to the Finnish Go Association, and EGF, if possible. We have to ask this: what is your number one advice for those who want to improve their Go skills? Whatever happens, don't stop endeavoring. Please love this game, love will bring your enthusiasm and passions into your studies and make you study harder. Sometimes, losing makes one disappointed and you might want to give up, but please remember hope is always in front of you. You'll get good improvement once you keep working on it. That's the No.1 advice: love! "That's the No.1 advice: love!" I guess it should be the one where I beat a 5p. It was not a very good game in terms of content, but I won it. ^^ Hopefully, in the near future, I may change my answer to this question to: "the one that my student beats me in a big tournament." That'll be the best prize to me, as a teacher. What do you like most in Go? The parts/ factors that have enormous similarities to life. Actually, compared to life, Go is relatively easier; life is a far more complicated "game" and we cannot afford to lose it. If you could play a game with any Go player (who has ever lived), who would you choose? 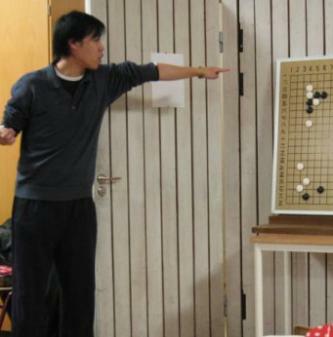 Do you have some other hobbies apart from Go? "[When] my student beats me in a big tournament, [that] will be the best prize for me, as a teacher." jenj (3k): 1) What do you think about intuition in Go? What is it? Do you use it? 2) Can you give advice for kyu-level players about reading (moves)? How to push the limits of reading ahead? How to learn to read deeper and wider? I believe everyone can be strong at reading, for sure, with enough practice and hard work. When you are face to face with a situation or a problem that you need to read (as practice, that is), if you have time, please do your best to be patient and read as far as possible. Start from those straight-forward or one way reading ones, and gradually expand to more variations. I have to say, there is no short-cut in reading, just never stop endeavoring. Never tell yourself you cannot do it. Everyone can, so you can! rice (3d, BE): what can I do as in self-training both specifically and generally to get from 3d kgs to 6d kgs? Chris Welsh (1d, ZA): How did you reach your current strength? Did you try to become pro, or consider it? "...compared to life, Go is relatively easier; life is a far more complicated "game" and we cannot afford to lose it." Do you think Lee Ch'ang-Ho will come back to get some titles soon? I really hope so, since he is one of my favorite players. However, to be realistic, the young generation of Chinese and Korean players already dominate. Lee Changho is still very strong and he is fighting against those young players still. He is also changing himself and, as I see it, improving, but that may be all that we can expect. It might not be very long that he can still fight on the top. That's nature and we cannot resist, sooner or later it will come. Ah well, this is almost impossible to answer. :P Fuseki is in general nothing about reading, but judgment and design; Yose is mostly about precise calculation and planning in advance; When it comes to fighting, that's the part related to reading, at least partly, since it's still very much about judgment actually. And about how far I can read in fighting, I have no idea unless you show me a specific example. ^^ Let's say that in different situations one's reading differs. I'm sorry that I may not have really answered your question, but I have to say what I mentioned is true. noth1ng (1d): What is the best way to study pro games? "I'd like to contribute more to European Go, especially on fostering young and talented players. That's what I'm good at, I believe." tengen (5k, BR): What does JeffChang think about start playing at Tengen (with black or even with white)? After watching that game Hikaru vs Yashiro, I tried it myself and found to be very funny. But I am not sure if it is a weak opening or just a complex opening. breakfast: 1) We have many Korean ex-inseis staying in Europe (or inseis, who stayed in Europe few years ago). It's strange that we almost don't see any Chinese here. How can we explain it? 2) What do you think about the current level of European main hopes - Artem and Ilya. Are they close to Chinese pro ranks or not? I haven't met Artem and Ilya, but I did watch many of their tournament games, especially the ones with my good friend Antti. Honestly, if they were to play in the pro rank tournament, in China, I don't think they would make it. You may say they might be stronger than some Chinese pros, or equivalent strength, but the competition in that pro rank tournament is extremely severe. But if we only say strength, I agree they are around equivalent strength with some Chinese pros already. Hopefully one of them, or another young European player, may represent Europe and beat an Asian in a world pro tournament. They need more of these opportunities. "Never tell yourself you can't do it." 3) What do you think about Jiang Weijie 5p, who recently won his first world cup by beating Lee Changho. Will he enter and stay in the elite of World Go? Jiang Weijie showed an outstanding performance and great reading in the LG cup final against Lee Changho. It is impressive indeed. He is definitely one of the elite pro players in the world nowadays. In China, there are many other players of the same generation who are actually around similar strength. If he wants to stay at the top, he needs to work very hard still. My personal opinion about the interview: it is inspiring. Jeff is one of the kindest people I ever met. I wish him the best in his future and all of his endeavors. Hello, thank you for this interview, it was great. Jeff seems to be quite a nice guy, I hope his Nordic projects will successfully take off! Cheers. Yes this was an excellent one, and shows the skill of Jeff presenting something very well. As I can state he has the same quality as a teacher in real life.